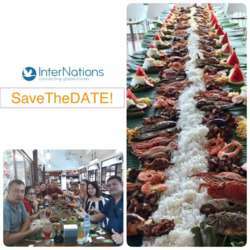 Join us for a ”boodle-fight”- our way! I recently experienced my very first “boodle fight” -the Philippine way and really appreciated the fun of eating in a different away. Although I didn’t eat without with unprotected hands, I surely did enjoy the fun! Boodle-fight as per Filipino definition is “a military style of eating” in which food, piled on top of banana leaves (we have to find a replacement for this if we can't find any in MÖLLEVÅNG) laid out on long tables, is to be taken with bare hands washed with water from jugs prepared on the side, which “eating combat” begins when the signal is given. OUR WAY will be decided by us so it would be exciting! Please join us and keep away the chill by sharing our very own favourite dishes from our countries. We are limiting attendees until we have decided on the venue depending on popularity. Looking forward to seeing you again in a less-formal dinner where we bring our own contributions and warm them up in the venue. PLEASE FEEL FREE SUGGESTING EXCITING IDEAS...more heads are better than one! NOTE: We may need to spend a minimal amount for the venue but this will be informed and confirmed to everyone just before the event.